Some Cities Pay Pothole Claims, But How Does It Work? 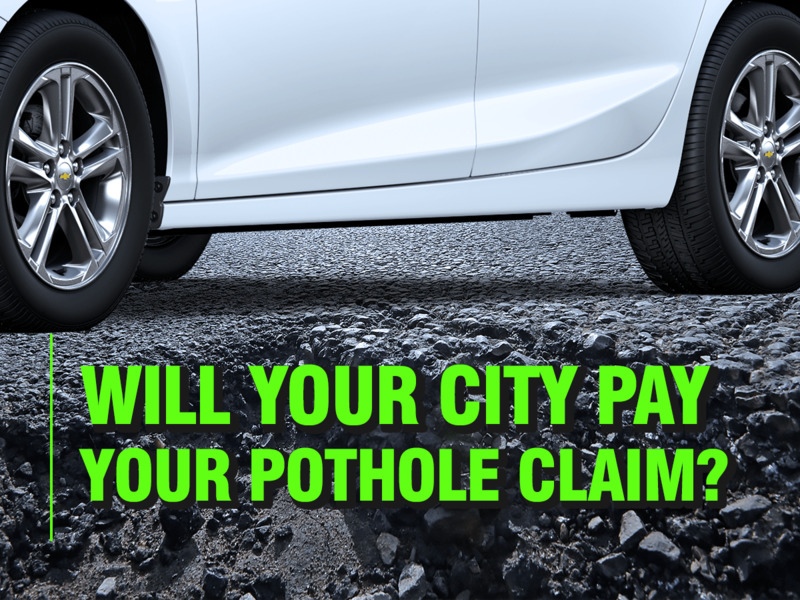 Home>Articles>Will Your City Pay Your Pothole Claim? Have you ever hit a pothole before? Odds are you have, and when you did it is highly likely that your heart felt like it missed a beat, even if you saw it coming. Not seeing them coming can also startle you too, but regardless of whether you are startled or not, many people have that internal fear that something may happen to their vehicle because of the pothole, and that whatever it is could be extremely expensive. In some cases, the city that you are living in will pay for extreme damage to your vehicle. In the Northeast and Midwest regions of the country, intense weather makes many cities more susceptible to potholes. Potholes are formed when moisture gets into the pavement and is exposed to freezing temperatures. As the moisture expands, the pavement cracks. Many cities find it hard to keep up with the damage that this creates, making a bumpy ride for residents and guests of the towns. If you are driving in a city that pays pothole claims, you might be in luck if your vehicle is damaged by potholes in the city. Claims because of pothole damage include blown tires, bent rims, lost hubcaps, alignment issues, flat tires, and more. If a pothole damages your vehicle, you will need to submit a claim to the government agency that is tasked with these types of damage claims. You will need to check with your city to determine what the process is for submitting insurance claims involving damage from potholes. In some cases, people who make claims can expect the process to take quite a while. Also, in some places, in addition to sending a complete police report, people will also need to send a paid bill or repair estimates from vehicle repair shops. Keep in mind that not all cities will pay the full cost of repairs, as you did drive into the pothole yourself. Sometimes the road commission the road falls under will pay for damage that is caused by potholes on that road. It may be a city road, county road, or state road. This can also be a lengthy process, and even if you go this route, you will likely need to pay the cost of your repairs upfront. That said, this is an alternative to filing an insurance claim, and it is possible to get reimbursement if you contact and follow the procedures for the proper road commission. It is a lot more likely that a city will pay pothole claims if potholes are an issue in the city. Each municipality, town, or city will have different requirements for filing and will pay claims for varying reasons. There are a few essential steps to take when filing for a pothole damage claim. First, you will want to document everything that has happened. This includes taking a photo of the pothole and making sure you have an additional picture so that you can confirm the location the pothole is at. You will also want to note both the time and the date of the accident. Getting estimates of repair costs from two different mechanics is a requirement in some states but is helpful even in states that do not require it. It can be more difficult to file for damages from potholes in some states than it is in others. In some cases, your insurance company may include some coverage for possible damage in your collision coverage policy. You will need to check with your insurance company to see if yours does, and this may be a more important task for you to do if you live in the city that has issues with potholes. In some cities, claims for pothole damage will only be paid if the city has known about the pothole for a specified period. Due to this, you will want to contact your town and let them know where potholes are, preferably by email, if you come across them. This can help them not only fix the potholes more promptly but can also help people have successful claims if damage to their vehicle occurs.